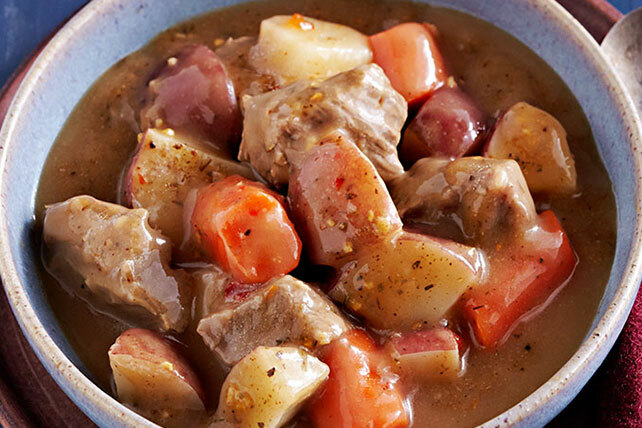 Indulge in comfort food at its most comforting: our Slow-Cooker Beef Stew is made with veggies, red potatoes and chunks of beef chuck roast. Toss meat with Dry Rub; place in slow cooker. Add all remaining ingredients except flour and water; stir gently. Cover with lid. Cook on LOW 8 to 9 hours (or on HIGH 4 to 5 hours). Mix flour and water until blended. Add to slow cooker; mix well. Cook, covered, on HIGH 15 min. or until sauce is slightly thickened. Cool any leftovers, then place in airtight container. Freeze up to 3 months. Thaw overnight in refrigerator before reheating to serve.